Technically, tiger nuts aren’t nuts. And they’re not any part of a tiger’s anatomy (if you were even going there, get your mind out of the gutter!). They’re actually tubers, like potatoes and sweet potatoes. And they’ve been in the news a lot as an original “Paleo” food – a food that our ancestors actually ate, that we can still eat today. Contrary to the advertising, there’s actually no solid evidence that tiger nuts made up 80% of Paleolithic diets in general. But they’re a pretty nutritious food, a good source of resistant starch, and fun to bake with. What the Heck are Tiger Nuts? Tiger nuts, technically cyperus esculentus, naturally have a huge range. They grow wild all over the world, and when they’re introduced to other places they move in just fine. In fact, they’re considered a weed in a lot of places because they’re just too good at surviving. The “nuts” (actually tubers) grow under the ground; the top part of the plant looks like a big tuft of grass. Once you actually get to the nuts, they’re about the size of a chickpea and taste mildly sweet and a little starchy. Did our Paleolithic Ancestors Eat Tiger Nuts? There’s a very common claim that tiger nuts made up 80% of our Paleolithic ancestors’ diet. This is mostly a lie with a kernel of truth. For one thing, our Paleolithic ancestors ate totally different things depending on where they lived. And the Paleolithic was a long time; diets varied from the early to the late Paleolithic. There was no one “diet of our Paleolithic ancestors.” Making a blanket claim like that is misleading and pretty indefensible as advertising – but there is a kernel of truth. The kernel of truth is in this study. The study was looking at an early species of hominin, Paranthropus boisei. P. boisei lived in Africa during the early Paleolithic, from 2.3 million years ago until 1.2 million years ago. The study argued that P. boisei relied on “low-quality foods like grasses and sedges,” including tiger nuts, for 80% of calorie requirements, which is presumably where the 80% number comes from. This is not a ringing endorsement of tiger nuts (they’re constantly described as “low-quality” foods throughout the paper). And the 80% number is for tuberous foods in general, not just tiger nuts. That number includes all kinds of foods other than tiger nuts. So the “80% of Paleolithic diets were tiger nuts” claim is nonsense. But there still is evidence that people were eating tiger nuts in the Paleolithic. What this study really shows is that one species of early Paleolithic hominins probably got around 80% of calories from a group of foods that includes tiger nuts (and many other foods). Not quite as dramatic or exciting, but still kind of cool. 19 grams of carbohydrate, 10 of which are fiber. Vitamins and minerals: tiger nuts have a decent amount of magnesium, iron, and zinc. They also have smaller amounts of a few other vitamins, but nothing to write home about. If you break that down by calories, about half the calories are from fat, with most of the rest from carbohydrates. In the Paleo world, tiger nuts are most famous as a source of resistant starch. Resistant starch is a prebiotic fiber: it feeds the friendly bacteria in your gut. Resistant starch has gotten a lot of attention recently for its ability to specifically feed the species of bacteria that might protect against various diseases; you can learn more about resistant starch here. Resistant starch is typically praised for all its good qualities, and it does have a lot of them. But not everyone does really well with huge amounts of resistant starch or fiber in general. If you’re not huge on fiber, then tiger nuts might not be the snack for you. Tiger nuts taste just a little bit sweet, with a nutty flavor similar to actual nuts (but remember: tiger nuts aren’t actually members of the nut family, and people with nut allergies can eat them just fine). It’s possible to eat them plain, but it can be kind of a commitment. After being harvested, tiger nuts are dried in the sun to make sure they don’t rot. This concentrates all the fiber and turns the nuts into a very intensive chewing experience. You can minimize this by rehydrating them before eating. Or, you can cook with them instead of diving right into the plain nuts. One option is to make horchata, a beverage made of ground tiger nuts mixed with water and sweetener. This is the traditional way to eat tiger nuts in Spain. There’s a recipe for a Paleo version here. 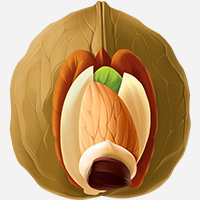 Note that if you make horchata, you’re throwing away the fibrous parts of the nuts, so you won’t get the fiber. This could be good or bad, depending on your tolerance for fiber. Another popular option is to use tiger nut flour for baking. Tiger nut flour is one more entry in the growing array of grain-free flours. Because it’s not actually made of nuts, it’s safe for people on the AIP. 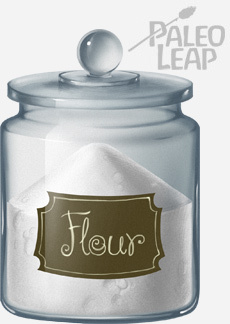 For low-carb baking, almond flour is probably still the better bet. But if you’re interested in baked goods with a lot of probiotic fiber, or if you want a little more fat for some reason, then tigernut flour might be a reasonable substitute for coconut. Here are some recipes! With every grain-free flour, it’s always kind of a trial and error to figure out how it behaves. For curious chefs, this post on Food52 has some entertaining stories of baking with tiger nut flour and pictures of the final products. Unless you live somewhere with a really great health food store, your best bet is ordering online. Amazon carries tiger nuts and so do most online health-food retailers. Are tiger nuts the perfect Ur-food of our Paleolithic ancestors? No. Not even close. But they have a decent nutritional value, they can be pretty tasty when they’re prepared right, and they’re a good source of resistant starch and fiber if you’re interested in that. For avid Paleo bakers, tiger nut flour is a little easier to use than coconut or almond flour, and the taste might be fun to experiment with.